Discover interesting facts and information about the weapons, including the Blowguns (Blow guns), used by Native American Indian tribes. Description and Definition of Blowguns (Blow guns): Blowguns or Blow guns one of the most ancient Native American weapons and was used by the Cherokee and many other Native Indian tribes. A blowgun (also called a blow gun, blowpipe or blow tube) is a simple weapon consisting of a hollow tube made of cane or reed for firing light projectiles, arrows or darts. The projectile is propelled by the force of the breath. 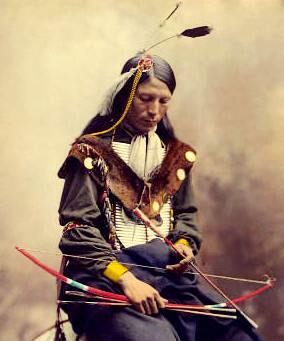 Native American Weapons - Blowguns (Blow guns). Discover the interesting facts and information which relate to the History of Native Americans and the weapons they used such as Blowguns (Blow guns). The pictures on this site show the weapons and tools that were used by various Native Indian tribes that can be used as a really useful educational history resource for kids and children of all ages. All of the articles and pages can be accessed via the Native Indian Tribes Index - a great educational resource for kids providing an unusual insight into their culture. We hope you enjoy watching the videos - just click and play - a great resource for gaining facts and information about the life of Native American Indians.